Artificial turf is a surface of synthetic fibers made to mimic natural grass. It is commonly used in arenas for sports that were originally or are normally played on grass. However, it is now becoming widely used on residential lawns and commercial applications. 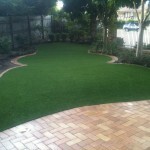 The main reason for the popularity of synthetic grass is the lack of required maintenance. Synthetic grass stands up to heavy use, such as in sports, and requires no irrigation, mowing, weeding or fertilizing. It is also popular in areas that are required to provide shade because of the difficulty of getting grass enough sunlight to stay healthy. Wet Pour is the process by which rubber granules are applied to a surface or area to be covered. This type of application is available in a vast variety of colours and granule types dependent upon the application. There are two main type of Wet Pour rubber being CSBR which is a pre-coloured recycled rubber crumb and EPDM which is a virgin synthetic rubber crumb. 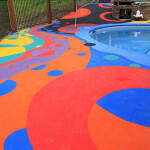 Both rubber types combine with a polyurethane binder to be installed by pouring and trowling over the desired surface. Wet Pour rubber makes an attractive, seamless, cushioned, hard wearing, non-slip outdoor surface for paths, patios, pool surrounds, playgrounds and more. Used specifically for super efficient playground underlay installations. Safety Surfaces’ Aero Shock Pads are a popular choice by astute facilities looking for a guaranteed surface compliance and installation savings. 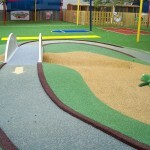 They are easily installed under either synthetic grass or Wet Pour rubber playground surfaces types for total compliance.